What was so great about this idea was that instead of a glass teletype, you had a full graphic computer, with a mouse, each user with his or her own local storage, all connected just the way users of minicomputers were. Understand the decision in the context of the times we were living in. You had to be a big thinker at the time to see that the devices we were making were primarily useful for their ability to communicate. Most people thought they were for spreadsheets or word processing. For automating operations that used to take more effort when done manually. It's not surprising, that's how people usually see new technology. But if you choose to think expansively, you can move faster. And Jobs certainly did. I wanted to link the word automating to an article about what used to be called office automation but I find that it's disappeared from use. It's a very good illustration of a point of view that only made sense in a short period. When everyone who worked in an office thought in terms of moving stacks of paper around as symbols of what is now done in a fully electronic way. It took Apple a while to get out of this mode of thinking. The Mac built-in networking was seen as a way to connect lots of computers to what were then very expensive laser printers. Desktop publishing was the dominant application for Apple until the Internet was fully in bloom, not until the mid-late 90s. NeXT was the birthplace of the web and later, the Mac had the best content management platform. 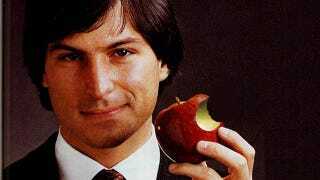 At NeXT and at Apple, he could have done much more to embrace the post-printing networked world. And would have, if he really got how much personal computers were about communication, not so much automating old processes. Eventually of course, Apple thrived in the new environment. But when it came to the internal architecture of the software running on his machines, and how it connected to software on others, Jobs didn't have many (if any) good ideas. Apple has floundered in this area. And nowhere was that indecision more obvious than in an interview he did at the D3 conference in 2005. He asked: Why is the file system the face of the OS? And he answered: "Now, e-mail, there's always been a better way to find stuff. You don't keep your e-mail on your file system, right? The app manages it. And that was the breakthrough, as an example, in iTunes. You don't keep your music in the file system, that would be crazy. You keep it in this app that knows about music and knows how to find things in lots of different ways. Same with photos: we've got an app that knows all about photos. And these apps manage their own file storage." I've always felt this was the wrong way to go. The structures you deal with in each of these programs is the same. And the stuff is stored in the filesystem. And iTunes is a user interface disaster, not an example to hold up. This may not have been so apparent seven years ago, but it is today. You can shuffle the parts around, and you still have the same problem. The data ultimately is organized in a hierarchy. If you can visualize that hierarchy, and provide interactions that make sense to edit and view that hierarchy, there's no reason the same browser shouldn't be used for all types of data. It does not have to be a "wall." All your stuff ends up inter-relating anyway. Do you use the emailer to send music files? Yes of course. Do you use a text editor to write about the podcast you just recorded? Yes. So why have 20 mediocre tools when what you need is one really great one. Why not focus your investment on each type so that investment can be re-used in any context? And not just contexts that Apple employees can envision, contexts that only make sense to a user, far away from Cupertino. I think the problem was the architects that worked for Jobs weren't as expansive as Jobs was, or weren't empowered, or weren't great programmers, or whatever. Apple did not get there. Not in Mac OS, and not in IOS. They did a nice job of packaging an architecture that doesn't work. Jobs basically says that in 2005, but he thought he had it licked then, and now we know he didn't. When it came to designing boxes, stores, office buildings, Jobs was the best. Numero uno. And a huge believer in focus. Shut out all the noise and focus on the problem you're trying to solve. And keep thinking and trying new stuff out, feeling it, using it, living with it, iterating until it's right. The same approach can be used with the structures that go inside the computer's memory as with the packaging and the sales environment, and the places where people work. The same attention to detail and nice touches, and overall design. We're not in the post-PC world as much as we are in the post-Jobs world. When we're done mourning his passing we'll realize that there are huge spaces we never fully explored because his presence loomed so large.